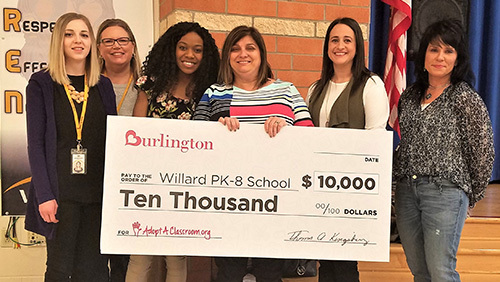 Burlington Stores Inc., through its partnership with AdoptAClassroom.org, is donating $10,000 to Warren City School District’s Willard PK-8 School in celebration of its new store at Howland Commons. Representatives from Burlington Stores presented the check to Willard Principal Michelle Chiaro during an assembly on Tuesday, March 20, 2018, at the school at 2020 Willard Ave. SE, Warren. A representative from AdoptAClassroom.org contacted school administrators and helped secure the donation, which will provide instructional supplies for each teacher’s classroom. Burlington, in partnership with AdoptAClassroom.org, makes a donation to a local school in each grand opening market to celebrate the new store location. The Burlington store at Howland Commons, Niles Cortland Road SE, Howland, is scheduled to open Wednesday, March 21.